To play in a league you must first join a team. Over 3,000 adult players in Lee County have found a team and you can too. Teams are formed at both park and club locations. They are organized into age categories including Adult (18-49) and Senior (50+). There are singles, doubles, combo, and mixed doubles leagues. They play mornings, afternoons, evenings, and Saturdays. If your schedule is unpredictable consider joining Ultimate Tennis that permits you to set the time for your matches. USTA sponsors a wide variety of league opportunities for Men, Women, Mixed, and Combo leagues at levels of play from 2.5 to 4.5 for adults 18 & over, 40 & over, 55 & over, 65 & over, Play is organized into four seasons. Contact Local League Coordinator, Carly Davis, at (407) 545-8940, ext 1415 davis@ustaflorida.com for details and contact information. Play begins in September, January, March and June of each year. TEAMS MAY PLAY OUT OF LEE COUNTY PUBLIC PARKS but each player must have a current LCCTA membership ($15) and pay an annual $25 League fee for all teams played on during the year. Most leagues play on weekdays, except for the mixed leagues that play on Saturday mornings. Evening play is available if there is sufficient interest. Over 2,00 women on 221 teams are expected to participate in the Lee County Women’s Tennis League (LCWTL) for the 2017-18 season. Play is organized in rated divisions beginning at the 2.5 level and senior (50+) divisions. Teams from club and park locations participate in the league that begins play in October and ends in late March. Visit http://lcwtl5.com/ to get detailed information about participating in this league. There is a league operating in Lee County - Ultimate Tennis where players are grouped by rating and players organize their own matches in singles doubles, and mixed doubles. Contact Ultimate Tennis Organizer,Bob Baker, (239) 450-0825, bobbakerpersonal@comcast.net for details. Visit: https://www.ultimatetennis.com/ to learn about the Ultimate Tennis Flex League. This doubles league begins in mid-November and ends in mid-March. All matches are played on soft courts on Monday, Tuesday and Thursday afternoons. 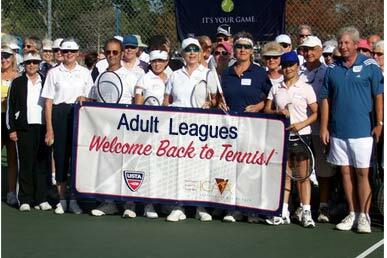 The Southwest Florida Tennis League provides competition among club-based teams in the Estero and Bonita communities for men’s and women’s doubles. All teams are club based and you must be affiliated with a club to join a team in this league. Matches are played on weekdays in the late morning and early afternoon hours. You must be 21 years old to play. The league season begins in mid-October and the playoffs are in December. Visit http://www.swfla-tennis.com/ for more information. The Lee County Couples Mixed League was formed in the spring of 2010 as a competitive league for couples in the country club setting. The divisions of play are 3.0, 3.5 and 4.0. For more information visit http://www.lccml.com/ or contact Tom Funk, Tennis Director at the Vines Phone: 239-267-7001 or Email at tennispro@esterocc.com.